Charles and Carolyn Reichenbach wanted to build a custom post-frame barn that would allow them to enjoy time with family and friends. They envisioned a dream structure that would include space for basketball and indoor soccer, plus a loft that would serve as a rec area. The couple also wanted to invest in a building that could later be converted into a large garage if they sold the property. Charles had done much of his own research into designing the perfect barn for their needs. With sketches already in hand, he searched for a custom builder able to take his concepts and transform them into reality on his Newtown, PA property. After seriously considering another builder, the Reichenbachs chose Quarry View Construction because they trusted our ability to provide high quality workmanship that provided excellent value for the family’s budget. Charles’s drafts served as the build’s launching point. Project manager Levi King worked closely with the couple as they refined and finalized their ideas before our crews started construction in August 2017. To create a lasting structure, we constructed the post-frame building over precast concrete columns, which provide a durable foundation, eliminating the rot and deterioration common in wood foundations. Our crews built the barn to include all the features the family had long envisioned, including an indoor sports area with a foldaway backstop and a roomy loft. Since Charles designed the barn for potential conversion into a garage large enough for an RV, we installed large powder-coated aluminum sliding doors. These provide more durability than overhead doors and give the building a charming rustic look. Quarry View crews wrapped up construction on the custom post-frame barn in late 2017. Since then, the family has been making good use of their new structure, which was topped with a beautiful 5-foot lighted cupola that serves double-duty as a fun lookout for the kids. 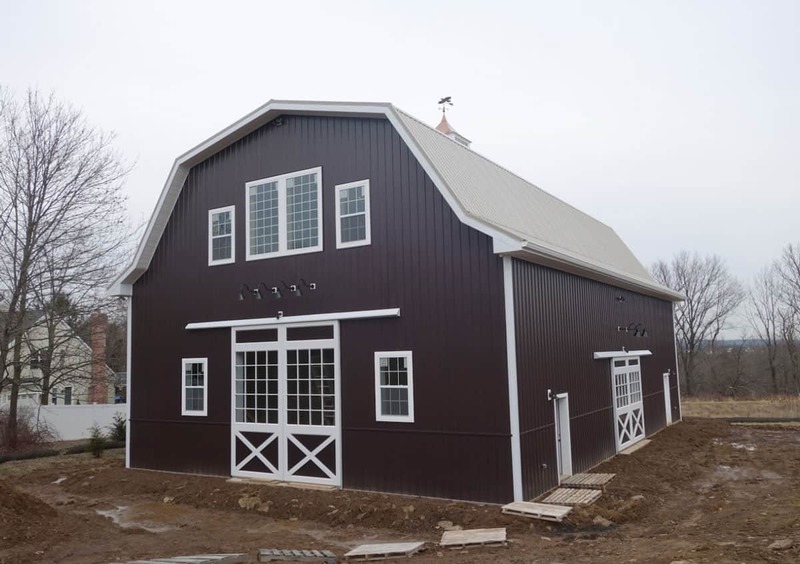 And, because we constructed the barn to accommodate the potential needs of future owners, the Reichenbachs have peace of mind that they’ve made an investment that adds value to the property. Whether the vision for a new barn is still taking shape in your mind or you’ve already drawn up exactly what you want, our barn-building experts will bring your dream to life.